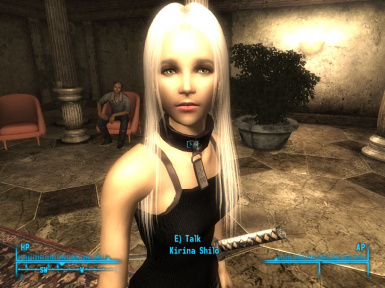 Still playing FO3 and Kirina is still my must have follower ! I am interested. Glad to see you are still keeping an eye on this mod. She's not only gorgeous, she's like a bloodhound @ detecting the enemy @ great distances.. I also increased her movement speed and gave her my best modified powerful weapon so she could defend herself in the world of MMM. In G.E.C.K. bring up her NPC window -> STATS -> SPEED MULTI % -> change # in BOX to what ever you want. I have her and all of my 12 companion set @ 300. That still gives each of them the option to go from crawling to FLASH the super hero speed when ever they need to. Sometimes if you blink you'll miss seeing her passing by you. She reminds me of the scout Indian in the western movies that's either ahead of you following the footsteps or she'll stay way behind you flanking the enemy. Most of times when I get lost in certain buildings or especially in large caves, when I see Kirina, I know that I can finally get out cos she will almost always be by the exit door. WEIRD! No.. I never send her home, but I like her just the way she is. It's almost like she has a mind of her own and no I haven't updated her to your latest update. If your latest update changes any of her tactics that I now like, I'll just leave her the way she is. Tried the latest update.. I still like my prior Kirina better. The newer one just seemed too normal for me. As a matter of fact I tried both at the same time and my older Kirina was still waiting for me at exit doors while the newer Kirina was mixed in with the rest of my companions. Figured I'd check back here for any update. I kinda understand it is not easy to make mod work exactly the way you want. Take your time and good luck. Ive ran into 2 issues with this companion. One is a dialogue compatibility issue that i think you should take a look at. more of a hopeful suggestion. The other is her bravery. I use HT Unlimited ammo for player and companion. 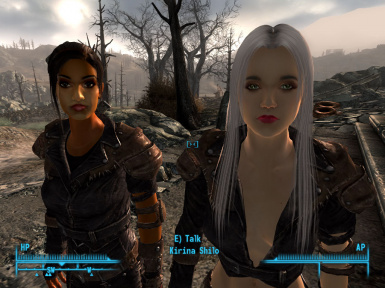 It adds a dialogue topic for companions to enable unlimited ammo which is what i use it for, while i use all sorts of companion mods for diversity this is the only mod that it does not add that dialogue topic. Im more of a Hoarder for ammo, weapons and armor. but only because my view when playing is extermination. could you look into this? At first she never runs from a fight, but i changed her bravery to cautious then brave and back to foolhardy. even at foolhardy she cowers and runs. could this be a bug? im doing a full clean install of my game for reasons. so please look into this.